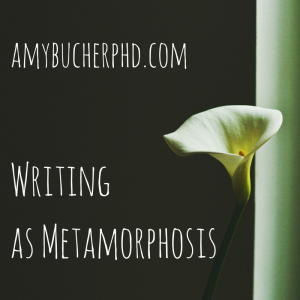 Writing As Metamorphosis | Amy Bucher, Ph.D.
How do ideas come into being? How are stories developed? Some people like to talk through their thoughts. Others, myself included, find their way to a conclusion through the written word. Writing, for many people, is not just laying words to paper but sifting through the story to arrive at a “true” telling of events. If the story is a personal one, then there’s also the task of arriving at a true telling of your own character. It can be a painful, difficult process, and relies quite a bit on the ability to rewrite, edit, cut, and change. I’ve started to notice that this process of self-discovery through writing is common to all types of artists. I’ve caught humorists, musicians, and authors all make reference to how writing is the vehicle for getting to a personal truth. Here are a few examples. Comedy: In a conversation with Mike Nichols recounted in Sick in the Head, Judd Apatow said, “I feel like, you know, you write movies to figure out why you’re writing the movie.” In the interviews that comprise the book, Apatow several times mentions how regardless of the topic of a movie he writes, he finds himself returning to similar themes that reflect his own experiences. In writing the movies, Apatow works through his emotional issues and spurs his personal growth. There is the identity you have in a band or as an artist when you exist for no one other than yourself, or for your co-consipirators, your co-collaborators. When you own the sounds and when who you are is whoever you want to be. There are no definitions as prescribed by outsiders . . . but once your sound exits that room, it is no longer just yours–it belongs to everyone who hears it. And who you are is at the mercy of the audience’s opinions and imagination. If you haven’t spent any time deliberately and intentionally shaping your narrative, if you’re unprepared, like I was, then one will be written for you. There are times that a work exists for the sake of getting you to the next step, as a testing ground for ideas, for recognizing parts of your process that were theretofore unnoticed or undiscovered. As you start out in rough drafts, setting down stories as clearly as you can, there begins to blurble up on the page what’s exclusively yours both as a writer and a human being. If you trust the truth enough to keep unveiling yourself on the page–no matter how shameful these revelations may at first seem–the book will naturally structure itself to maximize what you’re best at. You’re best at it because it sits at the core of your passions. This overlooks the reality . . . that most memoirists know the past can be a swamp. Nonetheless, most are trying to find footing on more solid ground. It didn’t happen in one instant. But over a period of a few days I went through a profound psychological shift . . . it was almost like I’d walked into some inner room where my lived experiences could pass through and come out as language. Across a variety of outputs (songs, stories, jokes, memoirs), writing helps people change and grow. It’s no accident that diaries are frequently recommended as part of therapy; research shows that personal writing can heal emotional wounds, and the stories above demonstrate how.